As the weather starts to turn a little cooler the Dragonettes of Pickens High School welcomed the Generals of Heritage to Jasper on Thursday with the hopes of cooling off the hot season of the Generals. Heritage came in at 10-1 overall and sitting undefeated at 6-0 in Region 6-AAAA. 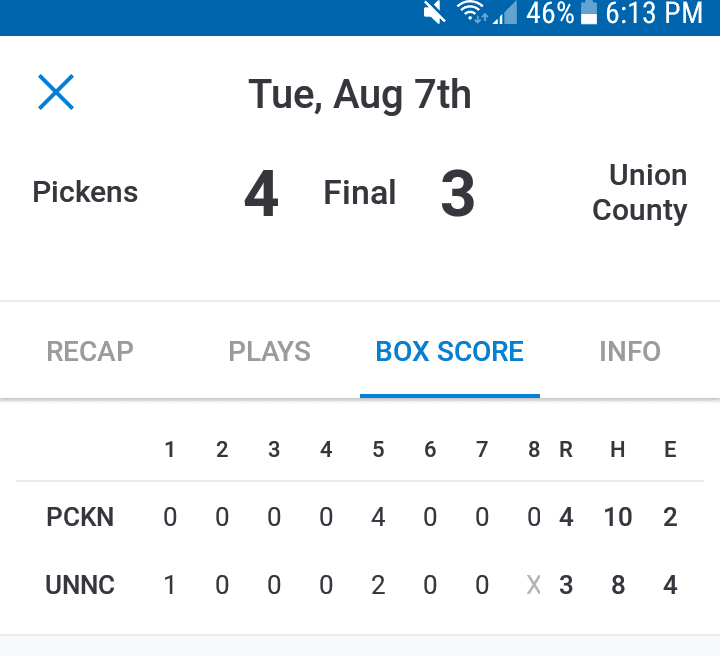 With Heritage having a loss on the season, Pickens knew that the Generals were not invincible but Thursday would not be the day for the Dragonettes to put another dent in the Generals armor. 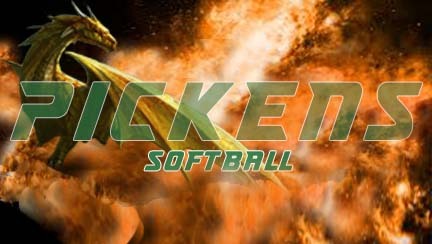 Facing a very strong line up and a pitcher in Rachel Gibson it would be a tough day for the Dragonettes. Gibson threw just 66 pitches in 5 innings allowing zero runs with 2 hits and a walk while striking out 6 opposing batters in the 11-0 victory. Heritage would score their runs in the first, third, fourth and fifth innings. Coach Sarah Pinson sent three different pitchers to the circle for the Dragonettes. Sarah Morris, Charlie Hulsey and Grayson Cleghorn. Morris got the start but only pitched one inning allowing 4 runs(2 earned) on 3 hits and 2 walks. Morris threw 31 pitches in the inning. Taking over in relief of Morris was Charlie Hulsey. Hulsey pitched 3 innings, throwing 41 pitches Hulsey allowed 5 runs(all earned) on 6 hits with 1 walk and 1 home run. Getting an opportunity to get in the circle, Grayson Cleghorn came in to close out the game for the Dragonettes. Cleghorn threw 20 pitches in her one inning of work with 2 runs crossing the plate (both earned). The Generals had 3 hits and one walk off of Grayson. These three ladies threw a really good game against a run scoring machine in the Heritage Generals. The Dragonettes will travel to Lafayette on Tuesday September 11 for yet another region game. Start time will be 5:55 PM. 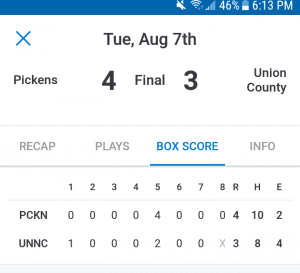 On Tuesday the Dragonettes of Pickens High School traveled to Whitfield County to face off against the Lady Bruins of Northwest Whitfield in a region match up. The Dragonettes(6-8 overall and 2-4 in Region) were coming off a loss to Ridgelad(10-2) were hoping to get back on the winning track and avoid dropping another game in the region standings. With just one hit in the game by Sarah Morris the Dragonettes couldn’t put anything together against very good pitching from the Lady Bruins. The two pitchers for Northwest Whitfield combined in throwing 76 pitches, allowing zero runs on just one hit. The pair had 8 strikeouts and walked two. Defensively the Dragonettes committed four errors making 6 of the 10 runs un earned for the Lady Bruins. Sarah Morris started the game for Pickens pitching 3 and 2/3 innings with Charlie Hulsey coming in for 1/3 of an inning to face the last batter. Together they through 109 pitches, 6 hits 10 runs(4 earned) all charged to Morris. Morris had 6 walks and gave up one home run to the Lady Bruins in the 10-0 region loss. Next up for Pickens will be September 6th at home as Heritage comes to Pickens High School for a region game. Start time is set for 5:55 PM. 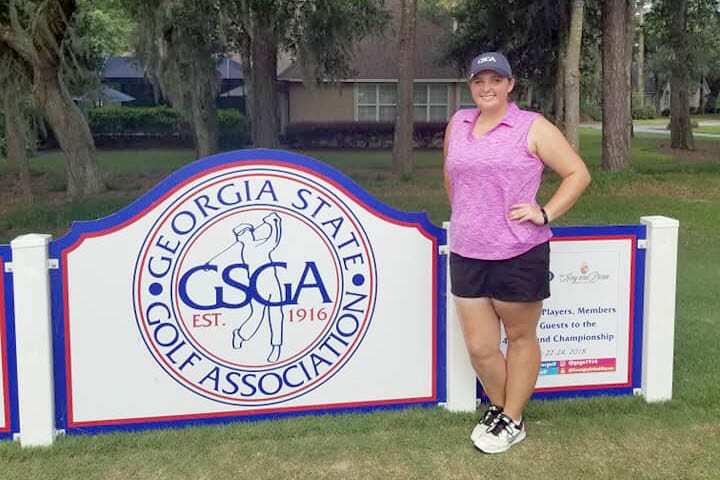 Pickens County High School’s Katherine Densmore spent some time in St. Simmons GA this week as she hit the links for the 2018 GA Junior Grand Championship Golf Tournament. This year the tournament was held at King and Prince Golf Club and produced some exciting golf . Top lady golfers from all over the State of Georgia attended this tournament with hopes of being crowned Grand Champion. Densmore battled hard over the three days with the challenges of some rain and of course your typical South Georgia golf fan…the alligator. 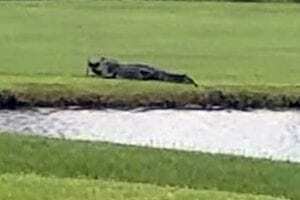 On day one, Densmore came with guns loaded and ready to have a good round and shoot a low score. She had her best round on day one with a 76 placing her in third heading into round 2. After a good 1st round, Katherine was hoping to continue to be consistent and that she did. with a 2nd round score of 81, Densmore found her sitting in a tie for second place but still within striking distance for the top spot. In the third and final round, once again she stayed with consistency that she had shown the previous two day. With a final round score of 77, Densmore took away all chances of anyone moving past her as she finalized her spot in second place on the leader board. Densmore finished second overall with a three day score of 234 just short of the first place three day score of 225. 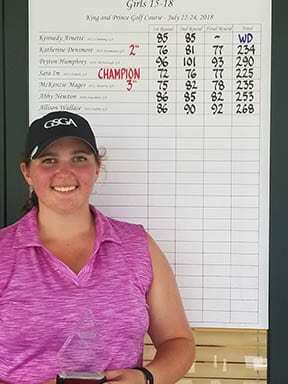 With this tournament, Katherine Densmore ends her summer tour of golf as she prepares for her senior year as a Dragon at Pickens County High School. This year will be bitter sweet for Densmore as she will play her final season as a high school golfer. Congratulations and best of luck in the 2018-2019 season.